Who’s That Pest? It’s Deer. In this series of articles, we will be looking into a variety of pests, some common, and others not-so common. We will take an insight into their instinctual behaviour, animalistic habits, seasonal differences and of course, what they can do to your crops or garden if unchecked! To start off this series, we’ll look into one of the more common pests here in the UK and abroad; the magnificent but potentially devastating deer! Wild animals are what make nature so wonderful to watch, and it is important we find ways to comfortably coexist in the best interest of humans and animals. Deer are a fantastic example of how this is possible, especially being a pest on the larger end of the scale. The diet of the deer varies dramatically dependent on the season. 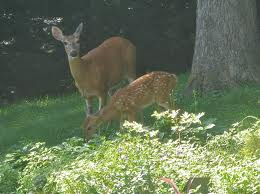 During the early, warmer parts of the year in Spring and Summer, deer tend to graze on grasses which contain necessary levels of protein for the deer to stay healthy. During autumn, deer will look for more substantial food sources which will provide them with the necessary fats to see out the colder months. The mating season, known as the rut, takes place in late July and August – usually the warmest time of the year. The kids are born usually around May or June following the rut, a favourable time of year for the offspring to survive. Twins and even triplets are very common, often left in shrubby areas with the doe returning to feed them regularly after feeding herself. Due to natural predators such as bears, large cats and wolves now being extinct in the UK, the deer population can become dense – especially if twins and triplets are common. Their excessive eating habits can be disastrous for agriculture, plant species diversity, and can cause significant damage to forestry. Wildlife rangers now manage deer population in a humane and sensitive manner. Muntjac deer are a timid and secretive deer, and prefer to hide in thick woodland and overgrown gardens. They are however very versatile when it comes to adapting to habiti, which has allowed them to spread through the UK very effectively. Fallow deer are more accustomed to a lighter variation of woodland with a dense undergrowth. They’re partial to thick meadows, marshes and are often seen on agricultural land – feasting on your crops! Roe deer are the most extrovert of deer and are more than happy in wide open spaces, and can been seen in large gardens in rural and suburban areas. With over 10 years in business, we have developed a highly effective pest-friendly spray for farmers, growers and avid gardeners to use against damage from deer. If you would like a friendly chat about how we can help, please let us know!